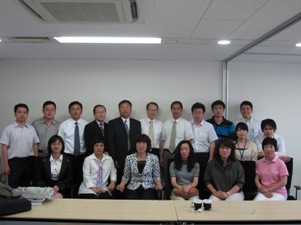 On June 11 (Fri.), 2010, a river inspection delegation from the Dalian Water Authority in Liaoning Province, China (13 members) came to Japan and had an exchange of views mainly on efforts for river restoration. 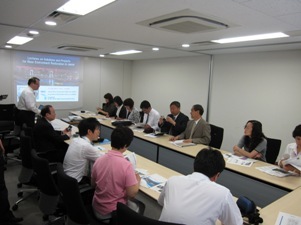 In order to learn recent ideas for river development in Japan and case examples of projects, delegation members planned to inspect rivers managed by local authorities in the Kyushu and Kinki regions, and exchange technology with related organizations in Japan. In Liaoning Province, the “River Channel Ecosystem Construction” was launched in 100 rivers as a three-year project in 2009. Partly for that reason, we had a lively exchange of views about technology, measures and case examples of improvement in river environment.